When I'm trying to impress someone or belong in a group, I become this overly chatty, overly excited, overly much of a d**kwad. It gets really annoying after a while. See the thing is now, I'm much better at realizing when it happens. I feel the need to constantly try and make jokes and make people feel at ease and accept me, but for most, it comes off as too much. So I do my best to curb stomp that behavior before it gets out of hand. And although I hate that behavior, I totally get it when other people do crazy things to secure the affections of others. Like this guy who jumped in after a crocodile in an attempt to impress a girl. Lee De Paauw was partying with pals and some new friends he made. One was Sophie Paterson. While walking along the Johnstone River in Innisfail (perfectly named), which is a crocodile habitat, De Paauw remarked that only backpackers get attacked by crocodiles, and that Australians are immune to the reptilian death machines. Rather idiotically, De Paauw decided to demonstrate the veracity of his bold claims by jumping in the croc enclosure. Guess what happened next? If you guessed that a crocodile almost immediately bit De Paauw's arm and tried ripping it off, then you were right. De Paauw said the croc was preparing to do its death roll when he quickly jammed his finger into the animal's eye and broke free. De Paauw suffered serious injuries and nearly lost his arm. He was rushed to a local hospital where his injuries are currently being treated. Australians started calling him "one of the stupidest men" in the country. De Paauw doesn't think so, though. See his sage reasoning below. The worst part is that Paterson wasn't really impressed with De Paauw's willingness to face crocodiles head on. Her response was pretty brutal, actually. 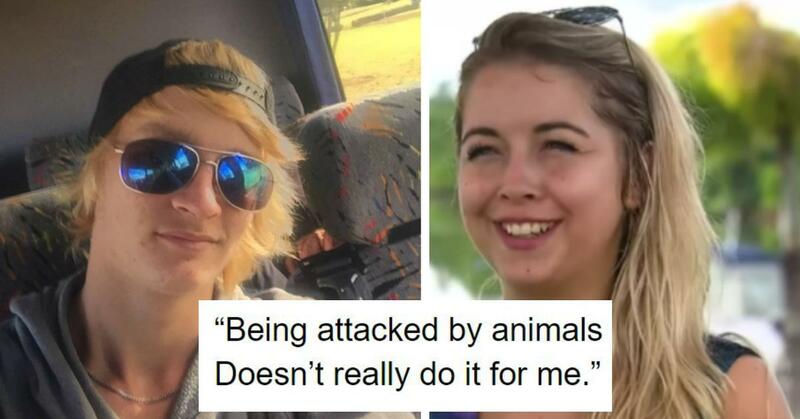 "Being attacked by animals doesn’t really do it for me," the backpacker said in an interview with Nova Radio. Yes, our man got attacked by a crocodile and he couldn't even get the girl's number. Twitter obviously found the entire thing hilarious and started joking about the terrifying scenario. Flowers and chocolates don't cut it any more. If you have a crush on me, get your arm half bitten off by a crocodile or it's no dice. @JamColley mateship is when you get drunk and dare someone to jump in crocodile infested waters and they have to jump in because mateship. Others were impressed with his bravery and fulfilling the Aussie dream of fighting a croc. Some found humor in other places. Now that would've been a story. Maybe next time, just try to have a meaningful conversation with someone, dude?